Britain's Prince Harry, Duke of Sussex and his wife Meghan, Duchess of Sussex, leave from the West Door of St George's Chapel, Windsor Castle, in Windsor, on May 19, 2018, after their wedding ceremony. Britain’s newly-married Prince Harry has had a long love affair with the African continent. He spent his post-graduation year in Lesotho, launched a children’s charity there and fell in love with his bride-to-be in Botswana. Africa is also the couple’s rumored honeymoon destination. Royal watchers are betting he and Meghan Markle will celebrate their recent marriage in the southern African nation of Namibia, known for its sand dunes and pristine beaches. That love for Africa shone through, observers said, at the wedding. Ululating guests gave the celebration an African flavor, while impassioned musical performances and a stirring homily from a prominent African-American theologian spoke to the difficult, painful — and jubilant — history of people of African descent around the world. As the couple — now known as the Duke and Duchess of Sussex — said their vows in St. George’s Chapel at Windsor Castle, millions of royal watchers across Africa watched raptly. They included Lesotho’s former foreign minister, while that nation’s crown prince had the unique distinction of being the only non-English royal invited to the wedding. Former foreign minister Mamphono Khaketla said she was “glued” to her TV for the wedding. She met the prince four years ago when he visited Lesotho. 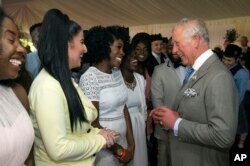 Britain's Prince Charles meets members of the The Kingdom Choir, who performed during the Royal Wedding of Prince Harry and Meghan Markle, during a party at Buckingham Palace, May 22, 2018. The event marked the 70th birthday of Prince Charles. Khaketla said she hopes the couple will continue their charitable activities. In Lesotho, that work has made a big difference, she said. She has become a regular guest on South African radio shows because of something a little more personal. Her Prince Charming — whom she prefers to call her “life partner” — is white. Until 1985, it was illegal for mixed race couples to marry in South Africa. Zakwe said she applauds the royal family for normalizing interracial relationships. Markle is the daughter of an African American mother and white father. “People just try to understand, ‘How can two people from such different worlds come together and accept each other?’ And usually what comes up — and I’m sure it comes up for Meghan herself — is, How can you be pro-black and yet spend your life with somebody from another racial group?’ And for me, I find that it always makes me uncomfortable. I find it problematic, because of course you can be pro-black and still be in love with somebody from another racial group,” Zakwe said. Britain's Prince Harry and Meghan Markle during their wedding at St. George's Chapel in Windsor Castle in Windsor, near London, England, Saturday, May 19, 2018. Hairstylist Lisa-May Hagemann said she felt the ceremony was the most inclusive royal wedding she has ever seen. The duchess honored several African nations in the Commonwealth, including South Africa, by having their flowers embroidered on her 5-meter veil. 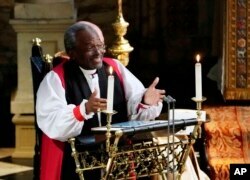 The Most Rev Bishop Michael Curry, primate of the Episcopal Church, speaks during the wedding ceremony of Prince Harry and Meghan Markle, May 19, 2018. Zakwe, who is unmarried, said she was thrilled at the optics of the wedding. Zakwe said something else clearly shone through the talented choir, the pomp, the diamonds and the guest list. What shone through, she said, was a powerful force — one that transcends race, language and borders: love.